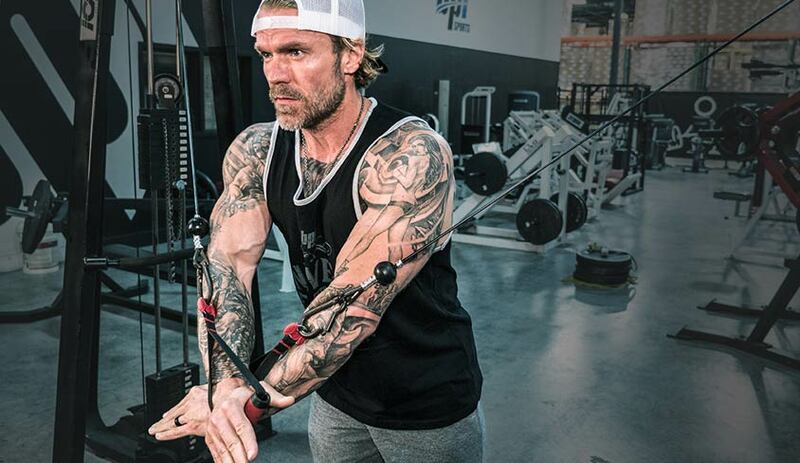 Cable crossovers are an essential part of James Grage’s chest routine. In this episode of Advanced Training Techniques, James discusses the proper techniques for the low variation of cable crossovers. You might be wondering why you should do low cable crossovers, versus in the middle or up high. In a nutshell, when you do a low variation, you’re targeting the lower part of your chest. In the middle, you’re targeting the middle, and when you’re up high, you’re targeting your upper chest. But let’s break down why that works. The pectoralis major is shaped like a fan and that’s because there are three different bundles to the muscle. There is the clavicular, the sternal and then your costal. Remember that as muscles contract, they shorten and pull. In the pectoralis major, the three different bundles create three distinct angles of pull. Hitting the intercostal targets the lower portion of your pec, the sternal the middle portion, and the clavicular is going to be the upper portion of your chest. That’s why people say you want to train with different angles to hit different areas of a muscle. And that’s especially true of a muscle like your pectoralis major. Why would you want to cross over versus a regular cable fly? It’s because of the extra range of motion. Knowing that your pecs help pull your arms across the body, by crossing over, you’re getting that extra range of motion. You see a lot of people doing the exercise with their arms bent, but that arm position doesn’t allow you to get a maximum contraction. The only reason people do it this way is because you feel stronger. Lighten the load and keep your arms straight. Both the low fly and low cable crossover are going to work the intercostal, the lower area of your chest. Now if you want to work the sternal, or the middle section of your chest, remember that those are horizontal fibers. During a cable fly, focus on coming right in front of your body right at chest level. For maximum range of motion, perform the cable crossover. For a lot of people, the upper chest is a weak point. To target the area, most people focus on the incline bench press, but what ends up happening is your anterior deltoids, or the front of your shoulder, takes over. Since they don’t realize this, most people don’t get the upper chest development they’re looking for. So using cables is a great opportunity to really bring your upper chest up. To target the area, keep the cables nice and high, at about eye level. For maximum contraction, switch to the cable crossover variation. Knowing that the clavicular bundle helps bring your arms up as well as across your body, you want to completely change your angle of pull. Position the cable in a low position. Again, keep your arms nice and straight. Take one nice big step forward, get that nice stretch, and bring the cables up in front of you. Your can do a cable fly right up in front of you or do a cable crossover for maximum contraction.